The Year of the Rabbit begins today, February 3, 2011. 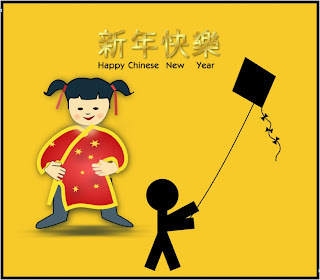 To celebrate Chinese New Year, I think we should go fly a kite! check out the list of resources I wrote about for Chinese New Year last year. There are many more ideas on Cybraryman's site, and at Larry Ferlazzo's blog. I found some lovely ideas to do with preschoolers for Chinese New Year on Fairy Dust Teaching. Tech Savvy Mama has excellent ideas too. Stay and Play has resources in a lovely pdf. I love what kite flying has to offer kids. Kite-making can be a great opportunity for dads and kids to get together for some special time. Kite-flying is a sport in its own right and may well be something your teens, tweens and adult children will all find an interest in. Just creating a kite of one's own, decorating it and experimenting with ways to make it fly can be an absorbing project. And examining different kites from around the world can be an excellent way to gain an inkling of other cultures. Crayola have some instructions for kite making and safety tips for kite flying. They suggest decorating the kite with one of the 12 animal zodiac signs. This first Crayola kite seems purely ornamental. The second one is simple but should fly. Here's a third Crayola kite, the air-flow, and they also have a more difficult Maori kite. Gomberg Kites has a gallery of kites from around the world. The same website has instructions for kite-making under Artistry and Craftsmanship. Let's Go Fly a Kite from Mary Poppins with separate music and lyrics or as a sung animation on Youtube. Not specifically about kites, but Riley and the Dancing Lion by Tania McCartney would also be a lovely picture book to share for Chinese New Year. I am fascinated by mini-kites. Admittedly, it doesn't take much to fascinate the Chook, but I love the way these things fly! I think your primary and junior high school kids might enjoy experimenting with these incredibly light and manoeuvrable kites. You can see one in action in this video. Don't be put off by the beginning, the guy soon cuts to the chase and shows you mini kites flying and how to make them. Kiting USA has some mini kite plans, plus galleries and more information. Here's another mini kite, made of straws and tissue paper, and a similar kite from eHow. There's also a miniature kite guild, with templates, but you need to register to download. What will you do to celebrate Chinese New Year? Xin nian yu kuai! Yes, Happy Year of the Rabbit - and I'll join you flying a kite - I think I might manage that better than a boomerang... :) And for some more books that feature Asian kites, here's a Link to a Personal View Aline wrote some time back on PaperTigers. Demi's Kites is one of my favourte kite picture books, and accompanied by her Happy, Happy Chinese New Year! they are perfect for erm, Chinese New Year! Happy Chinese New Year! To bring in the year of the rabbit, I'll be giving away free digital copies of my book: Covert Youth Agency, The Case of Tangled Love. Just email me through my site: www.jasonancona.com (under "contact"} and say Happy Chinese New Year in your post. Promo good through tomorrow: 2-4-2011. Thanks for those links, Marjorie. I should know by now to search Paper Tigers when I research a blog post! Boomerangs are so much quicker to make than kites but I must admit those mini kites are calling me! What fun to celebrate with kites! Last year @Maggieswitz did an inquiry project with her students on making kites, it was a wonderful learning opportunity! Kite flying is one of those things that's bound to bring a smile to everyone's face I think Kelly! Thanks for the great resources Susan! My little guys would love celebrating by making their own kites. What a great idea! Not strictly traditional to fly kites for New Year, Holly, but so much fun!